I’m not ready to commit myself yet to one side or the other of the inflation/deflation argument. Part of me thinks that we are heading for a massive dollar depreciation, which would lead to an inflationary squeeze. Another part of me thinks that we are short short short on consumer demand. Here’s a data point in favor of the deflation argument. As part of my previous post, I calculated personal consumption expenditures, subtracting out education, health, and housing. Education and health have big government support. Housing also has government support–in addition, much of housing PCE is imputed rent on owner-occupied housing, so does not reflect actual out-of-pocket outlays. 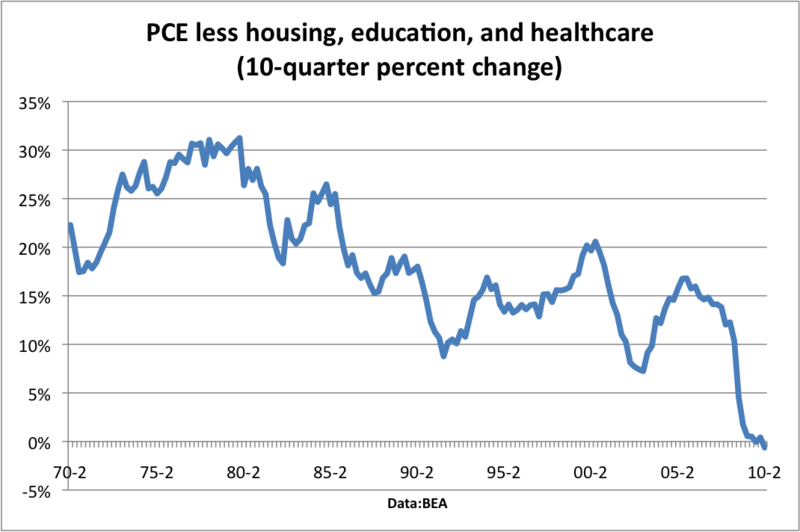 So this chart shows the 10-quarter percentage change in PCE, ex health, education, and housing. Consumer spending today is *lower* than it was at the beginning of the recession, outside of education,healthcare, and housing. What’s more, the growth rate has been on a steady downward trend. This is not simply an artifact of population growth. The per-capita graph looks just the same. What does this all mean? Just as the government-supported health and education sectors have been the main source of new jobs since 2000, so has health and education (and housing) been the main support for consumer spending. Ladies and gentleman, we’re at a turning point. Assume for the moment that we need to combat deflation. Should we accept the long-term trend, where the government becomes the main driving force for the economy? Or should we do everything we can to revivify innovation and private sector growth, and fight deflation in that way? Are Keynesian policies the only way to deal with deflation–or can we leverage new technological capabilities and innovation to create demand a different way? « Where Americans Are Spending More.. When you say government, do you mean fiscal policy, or are you referring to monetary policy and fiscal policy? Because, even though the fed is independent, in my mind it is part of the government, and so any drive to fight deflation will likely come from the government. Given the way the alternatives are presented, I assume that “revivifying private sector growth” would mean boosting nominal AD through monetary policy? I guess I agree with Matt Yglesias; there will be no growth in the private sector until there is AD growth, and since businesses as a whole won’t expand until that happens, either fiscal policy or monetary policy will have to do the heavy lifting. However, if it is monetary policy, that would probably be a whole lot better for the private sector than if it is through fiscal policy. Of course, if boosting nominal AD doesn’t work, it might just mean the fundamentals of the economy are lacking, and I am not sure that can be addressed without involving the governing bodies of the country in a major way. My goodness, what joy. Innovation provides the sustainable fix – if it can be ramped up before we fall into an economic abyss. I rather suspect that the policy response is not an either/or but something that is staged and transitions from temporary to long term fixes. The challenge is accomplishing this in the context of a suffering and panicking electorate. Here is a fix idea … add a $2/gallon tax on gas, phased in over 20 years (starting with $.05 first year, and getting to $.25 in last year) … call it the Medicare solvency tax, and have it directly fund Medicare and not accessible to the Senate or Congress. 3) Create a long-term price road map around which companies like Tesla, can plan … part of the problem with so many ‘fixes’ today is that they’re gimmicks … businesses, especially those that require long term investment, want long term policies they can plan around. "Regulatory Improvement Commission: A Politically-Viable Approach to U.S. Regulatory Reform", (with Diana Carew), Progressive Policy Institute, May 2013. "Student Debt Investment Fund (SDIF): A Preliminary Proposal for Addressing the Student Debt Crisis", (with Diana Carew and Jason Gold) Progressive Policy Institute, March 2013. "The Geography of the App Economy"(with Judy Scherer), South Mountain Economics LLC for CTIA, October 2012. "Beyond Goods and Services: The (Unmeasured) Rise of the Data-Driven Economy" Progressive Policy Institute, October 2012. "Manufacturing in the App Economy:How Many Jobs Should We Aim For" (with Diana Carew), Progressive Policy Institute, May 2012. "Hidden Toll:Imports and Job Loss Since 2007" (with Diana Carew), Progressive Policy Institute, March 2012. "Measuring the Real Impact of Imports on Jobs" (with Diana Carew), Progressive Policy Institute, March 2012. "Where the Jobs are: The App Economy" South Mountain Economics LLC (for Technet) February 2012. "Scale and Innovation in Today's Economy," Progressive Policy Institute, December 2012.